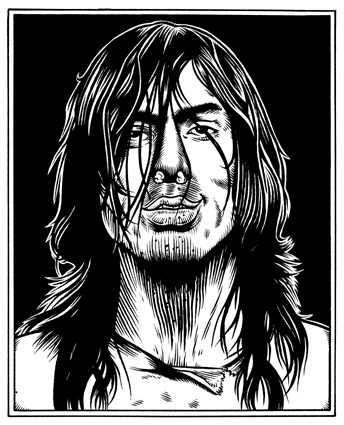 This is a b&w portrait of Andrew WK, a slight take-off of a famous pic of him, I guess (it was all dictated by the art director). The picture was printed in two-color, with blood red flowing from his nose, but the blood was done on the computer; this image is what's for sale: a more conservative portrait of this fine young man, suitable for hanging in your teenage son's bedroom. The image is about 4" x 5", india ink on bristol board.